Description: SCP-1086 is an immunosuppressive disorder brought on principally brought on by infection with a heretofore undiscovered species of bacteria. Infected individuals are designated SCP-1086-1. The disease has two primary effects on the human body. First, the disease causes the body to reroute 9█% of its leukocytes to a single location in the mediastinal lymph node, forming a translucent, gelatinous mass identified as SCP-1086-2. During the formation of this mass, white blood cells are converted into a mass of closely-interconnected neurons, glial cells, synapses, and circulatory tissue; the final mass will be composed principally of these cells and the bacteria responsible for transmitting SCP-1086, making SCP-1086-2 especially dangerous. The bacteria responsible for SCP-1086 has shown a total immunity to bacteriostatic antibiotic agents, and a near-total immunity to bactericidic antibiotic agents; in those cases in which bactericidic treatments are effective, the bacteria's rapid rate of reproduction effectively nullifies the treatment's effect. Second, due to the sudden near-total suppression of the body's immune system, infected individuals will develop multiple opportunistic infections, leading to the victim's rapid death. The bacterial species responsible for SCP-1086 is found only in infected humans and in SCP-1086-2; it has not been located in any other environment or species. SCP-1086-2 is produced by affected individuals during the course of the disease, and is the principal vector one of the principal vectors for transmission of SCP-1086. A marked difference between SCP-1086 contamination and other immunosuppressive syndromes is the pattern displayed by the opportunistic infections that ultimately result in the patients' deaths. While other immune-suppressing disorders result in a wide variety of different infections, SCP-1086-1 iterations consistently contract infections in a particular pattern, detailed below. The course of SCP-1086 is included in Addendum 1086-1. Stage 1: Initial infection, either through contact with bacteria or through death of prior instance of SCP-1086-1. Patient will rapidly lose immune system protection and fall prey to any number of dermatological diseases. The full list is included in Document 1086-32. However, regardless of the exact nature of the infection, all Stage 1 symptoms will be skin-related, and all will result specifically in severe pockmarking and blistering in geometric shapes across the patient's body. Without skin grafts, SCP-1086-1 iterations will die before entering Stage 2; as per containment procedures, this is to be avoided at all costs. SCP-1086-2 will begin to form in the upper chest of affected individuals, integrate itself into the nervous system, and begin sending messages to the brain. This process reverts the body's leukocytes to a pluripotent form and reassigns them as neuronal tissue; this process is very energy-taxing, and will burn through affected individuals' stored fat deposits quickly. Massive amounts of supplementary nutrition must be supplied to SCP-1086-1 to avoid death at this stage. Infected individuals become contagious six (6) hours after initial infection. Stage 2: Beginning of neurological symptoms, eighteen (18) hours after initial infection. SCP-1086-1 iterations will become intensely feverish and lose the ability to form coherent sentences during most of their waking hours, speaking only mostly in rambling passages with no discernible meaning; the words will be clearly spoken, but the sentences will be incomprehensible in most instances. The only consistency in this stage is the insistence on the part of affected individuals that they are "lost," without any further explanation. Most patients will likewise contract conjunctivitis during this stage, though all other symptoms will be neurological in nature. SCP-1086-2 will begin sending increasingly complex signals to the brain, which affected individuals will perceive as droning music and mumbling voices. It is believed that the utterances from SCP-1086-1 are attempts to process or describe these sounds. The subject's brain and SCP-1086-2 will "battle" for control over infected subjects' bodies, with the brain invariably losing. Stage 3: Total takeover by SCP-1086-2, forty-eight (48) hours after initial infection. Cerebral tissue in affected individuals will begin to decay to an unusable extent, giving SCP-1086-2 increased control over affected individuals' bodies, particularly the speech centers of the brain. During this time, SCP-1086-1 iterations will begin uttering a name and a series of numbers; these numbers can be processed into rough coordinates describing a location somewhere on Earth. These messages will be interspersed with hysterical periods of unintelligible babbling, believed to be attempts on the part of SCP-1086-2 to request assistance. Individuals will repeat these phrases for one hour, at which point SCP-1086-1 will go into convulsions and expel SCP-1086-2 orally. All personnel nearby must wear Biohazard Level 4 "blue suits" during Stage 3; any violation will result in quarantine as a new iteration of SCP-1086-1, as infection is almost certain without total isolation from the contaminated environment. Infected individuals will enter a comatose state and die within six (6) hours after expulsion. 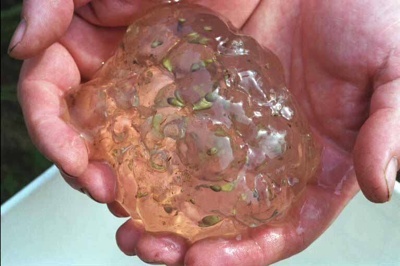 On 07/08/94, over two hundred small gelatinous masses fell onto the town of Oakville, WA, USA. These were found to be the initial iterations of SCP-1086-2; ██ individuals were infected with SCP-1086. Foundation personnel surrounded and quarantined the town, and were successful in capturing all contaminated individuals. While the use of amnestic agents allowed for the suppression of news of the event, the event reoccurred five more times over the next █ days. MTF Gamma-5 ("Red Herring") was unable to completely prevent all news of the phenomenon from escaping, but was successful in creating multiple false leads and misdirecting public understanding of the event.